Passed away on November 29, 2017. Preceded in death by husband Oliver. Survived by her daughter Kaye (Dennis) Warning, sons Steve (Linda) and Bruce; grandchildren Jessica (Andy) Dean, Cory (Misha) Warning; great-grandchildren Ella, Oliver, Genevieve, Isla, Emme; also survived by brother Donald Schwanke and sisters Lorraine Nyberg and Betty (Harold) Miller; sister-in-law Marguerite Welin and many nieces and nephews. Memorial Service Wednesday, December 6, 2017 at 11:00 AM at REDEEMER LUTHERAN CHURCH, 3770 Bellaire Avenue, White Bear Lake. Visitation one hour before service. Private interment Evergreen Memorial Gardens. Memorial preferred. 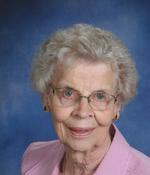 To send flowers to the family of Delores Caroline Welin (Schwanke), please visit our Heartfelt Sympathies Store.